The word Grandmom is synonymous to a lot of things, like Delicious mangoes, Besan Laddus, Chocolate bars and Cream wafers. These are the things she used to treat me to whenever I visited her at Dehra Dun. I loved summers as a child. I would come back all plump from vacations to Granny’s. When I woke up it was inflated well enough. I gave it a few hard punches (believe me beating the dough is really therapeutic). I shaped it and put it into the oven to bake. The best part about doing all this is that it doesnt take up much of your time and you can actually sit down and talk to people who have come to meet you rather than stand in the kitchen deep frying till the smoke cooks your face. I seasoned the bread with the things that I like – carom seeds, Italian seasoning powder and pepper. However you can use chilly flakes, fenugreek leaves, garlic or anything else you like. Heat a glass of water till it feels hot on your wrist (not boiling hot !). Stir in the yeast and sugar till the yeast completely dissolves. Allow the yeast to proof. Meanwhile mix the flour with salt, olive oil, refined oil, pepper powder, carom seeds and Italian seasoning. Now mix the yeast liquid into the flour one tablespoon at a time. If you are left with yeast liquid and the flour has already come together then you might have to leave it. Sorry for the wastage. Now knead the dough for 10-15 mins. Stretch it away from you, fold it back into quarter and continue to knead in the same manner. Allow the Dough to rest in a warm place for about 1-2 hours. Once inflated, punch it down and knead very little. Shape the dough as you like and place on a greased baking tray. Allow it to rest for 5-10 mins. Then bake in a preheated oven at 180 deg C for 25-30 mins. Instead of 2 cups of self-raising flour you can use 1 cup of all purpose flour and 1 cup of whole wheat flour. 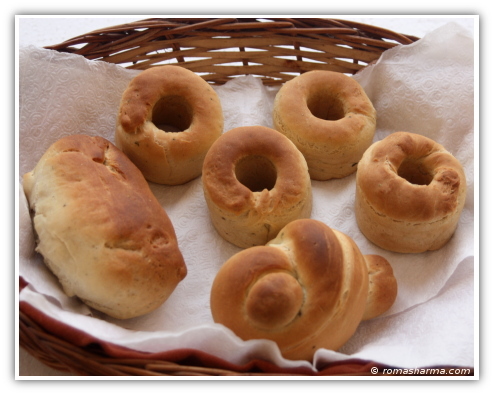 The buns might not have a light and fluffy texture but will be more nutritious. The food looks delicious. Gotta say, nice snaps. Looks yumm… Had tried stuffed potato buns once and failed miserably:-(. The buns became shells for the filling, rather than fluffy all around. Dunno what went wrong. Will surely try this one out. Awwwww, grandma and mom, that’s fun 🙂 Lots of good food and recipes, too! Bread looks super yummy! It looks lovely!!! lovely to eat warm….must try. A basket full of goodness. These buns do look very tempting. Great spice additions. Please could you tell me where we can get non-stick baking trays and muffin moulds in Bangalore? i have been looking for them all over..
You can find baking trays and muffin moulds in Nilgiris (Brigade road). I dont think the non-stick ones are available there. For that you might have to try ibca (institute for baking and cake arts) on Mission Road. These two are the best places in Bangalore to get any baking equipment.